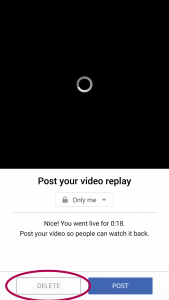 Facebook Newsroom reports that people watch a live video three times longer than a static pre-recorded video. And the reach for live posts is 10 times more than normal posts. Because people engage with them, react to them, comment on them. Did I mention this is free promo for your business right now? These compelling statistics might still not convince you. I should know, my business is built on it. There’s nerves about maybe looking silly, getting something ‘wrong’, not having control, not being sure of the tech/equipment, just to name a few. 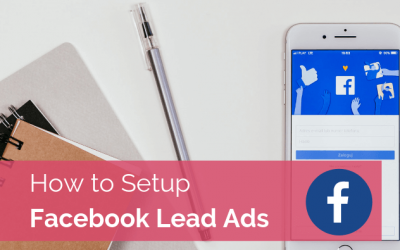 But if you’re ready to try, to make the most of the reach Facebook is giving it, to grow your business and your bottom line by putting aside those nerves and trusting that I have your back – read on! First things first – HOW do you ‘go live’? You can go live on your personal profile, your business page, in groups and events. On your personal profile, the audience defaults to your friends, but you can change it to public, custom, just specific friends, or only YOU (especially good if you want to practice like no-one’s watching). 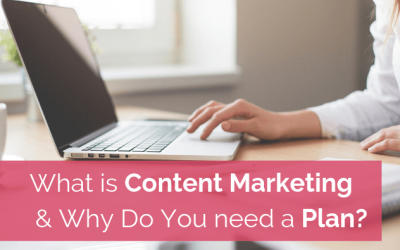 On your business profile, the audience is public – anyone who likes your page or follows you, and they can share it and so can you. In a group you admin, go live to your heart’s content to the group members, but if it’s not your group, check with the group rules before you go live, just to make sure and be a good citizen. In an event you are an organiser for, you can go live to anyone who can see that event. 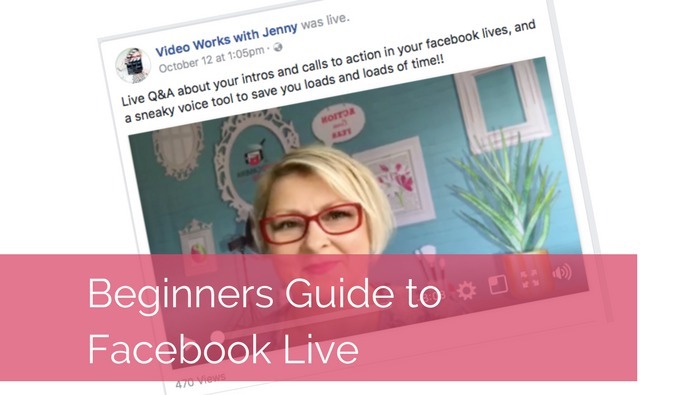 If you are new to this, or even if you’ve done a few live posts already, here are some things you might not be aware of that a Facebook live newbie needs to know. 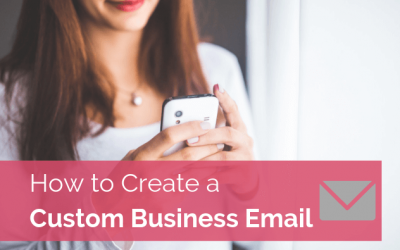 It will get you up and running sooner than later, and build rock solid confidence in the message you have to share. You press the blue GO LIVE button and get the 3, 2 ,1 countdown, then…..crickets. This is normal. It takes a while for people to know you are live but the notification in their newsfeed. It may seem awkward and weird, but talking about the weather isn’t a bad idea while people cotton on that you’re there and click to join in. You have moved on and then a comment takes you back to your previous point. This happens all the time and is absolutely ok. If you are encouraging people to get involved, this is going to happen. Here’s an example. You wait until the comments come through which means you are saying mostly nothing while you wait. This is okay too. Especially if you are waiting on a response to a specific question. 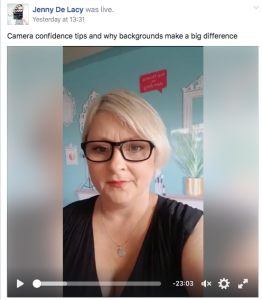 Make sure you hold your phone vertically to a Facebook Live, the main difference is how the recording looks – side bars or not. turn off the wifi on your phone and use your mobile data. Careful of the costs, and turn your wifi back on as soon as you’re done. I do this every time now, as the wifi issue was driving me crazy. 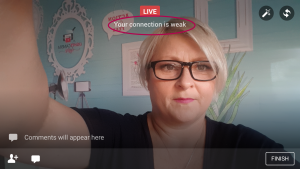 If you want to practice using the feature you can always choose to go live on your personal profile and change the audience to ‘only me.’ This gives you a chance to dance like no one is looking. See if the camera angle is right, the light is on your face, you’re easy to hear etc. Even if people saw you live, and lucky them if they did, you don’t have to post it to the page permanently. I have done this a couple of times when I felt I didn’t get my message across properly. And in one of them I sounded super grumpy, so I deleted and did it again. Also, if you do this, don’t sweat it. Just say oops – sorry guys, see you on my page in just a tick. And redo it and move on! I have seen so many people do this, its almost true that you can’t be a true online entrepreneur unless you’ve done this! Don’t try to share words on a whiteboard or posters – they might be backwards. Facebook has reported that this is because of settings on our phones, but it seems pretty universal. 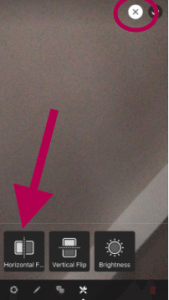 On investigation, SOME Facebook accounts (again, alas not mine) when you are live click the wand icon at the top of your screen and you might see you can flip horizontally and voila! Words the right way round. 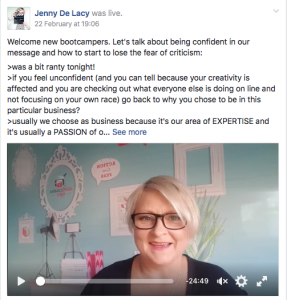 Would you like to know more about how to craft powerful video messages, set up on a budget to create high impact social videos for your business marketing and more? No more random acts of video or facebook live! Check out her workshop dates here – run in Melbourne and online, there’s bound to be one to suit you.